In the nineteenth century, German scientist Rudolf Virchow expanded scientific understanding of the Law of Bio­genesis. Virchow “recognized that all cells come from cells by binary fusion” (“Definition...,” 2006). In 1858, he made the discovery for which he is well-known—“omnis cellula e cellula”—“every cell originates from another existing cell like it” (Gallik, 2013, emp. added). The Encyclopaedia Britannica says, concerning Virchow, “His aphorism ‘omnis cellula e cellula’…ranks with Pasteur’s ‘omne vivum e vivo’ (‘every living thing [arises] from a [preexisting] living thing’) among the most revolutionary generalizations of biology” (see “Rudolf Virchow,” 1973, 23:35, emp. added, parenthetical items and brackets in orig.). So, in nature, life comes from life of its own kind. In the words of the McGraw-Hill Dictionary of Scientific and Technical Terms, “biogenesis” is the “development of a living organism from a similar living organism” (2003, p. 239, emp. added). In the words of Stephen Meyer, whose doctoral dissertation at Cambridge University was in origin-of-life biology, “From ancient times, humans have known a few basic facts about living things. The first is that all life comes from life. Omne vivum ex vivo. The second is that when living things reproduce themselves, the resulting offspring resemble their parents. Like produces like” (2009, Ch. 3, italics in orig., emp. added). For the same reason that dog-like creatures do not give birth to cats, horse-like creatures do not produce pigs, and frog-like creatures do not have snakes, it is also true that ape-like creatures do not give rise to humans. However, if evolutionary theory is true, this is, in essence, what happened. Even if a miraculous occurrence of abiogenesis were granted, this chasm still remains for the evolutionist to cross in order for his theory to be true. Perhaps you have seen the standard pictures illustrating the gradual evolution of man from ape-like creatures? Evolutionists draw such pictures and proudly pronounce such ideas to be plausible and even factual. The result: Millions of disciples have been made. However, the Law of Biogenesis stands in the way of this assertion, because evolution requires that creatures do not give rise to other creatures like themselves. In the field of philosophy, there is a law of logic known as the Law of Excluded Middle, which says that every precisely stated proposition is either true or false (Jevons, 1888, p. 119). As long as one precisely states a proposition, it can be known to be either true or false. If we define a bald person as a person having fewer than 200 hairs on his head, then every person is either bald or not bald. Similarly, as long as we precisely define what a human being is (and scientists have done so), every creature either is or is not human. In order for evolution to be true, the evolutionist must argue that a non-human has, in fact, given rise to a human at some point in the past—either by birth or by transformation (i.e., a non-human suddenly transformed into a human while alive). A proponent of transformation would likely be scoffed at, and the birth of a human from a non-human would violate the Law of Biogenesis. So, again, evolutionary theory is left with a gaping chasm that it cannot cross in hopes of attaining validity. The position is that there are of course lots of cases where you can say without hesitation: “It is a lion, it is a horse, it is a man or it is not a man.” But it is, it seems to me a consequence of evolutionary theory that species shade off into one another. Hence when you are confronted by marginal cases, you cannot say this is definitely human or this is not definitely human (p. 25, emp. added). So, there are creatures that are neither human nor non-human? As Warren stated in his rebuttal, such an illogical position denies the firmly established Law of Excluded Middle. As long as a “human” is precisely defined, everything is either human or not human. It is logically impossible to be neither human nor non-human. The more Warren pressed Flew on this matter, the more illogical Flew was required to become in order to hold to his position. The bottom line is that every being is either human or non-human. In order for evolution to be true, a non-human had to give rise to a human at some point in the past—either by transformation or birth. Based on the scientific evidence, neither is possible. And yet, there is no other option for the evolutionist, unless he contends that the first human just popped intact into existence spontaneously—like a fairy or like a mythical dwarf springing from the ground. And yet this assertion would violate the First Law of Thermodynamics (cf. Miller, 2013), the Law of Biogenesis (cf. Miller, 2012), and, of course, reason itself. Life comes from life of its own kind. Period. Even the evolutionary textbooks admit as much. Concerning the reproduction of living organisms, Prentice Hall’s textbook, Life Science, states: “Another characteristic of organisms is the ability to reproduce, or produce offspring that are similar to the parents. For example, robins lay eggs that develop into young robins that closely resemble their parents” (Coolidge-Stolz, et al., 2005, p. 35, emp. added). Robins make robins. There may be small differences in color, height, beak size, etc. However, the offspring is still a robin—not a shark and not a hawk. Evolutionary theory is not in keeping with the scientific evidence. However, the biblical model, once again, is in perfect harmony with the scientific evidence. God, the Being Who wrote the Law of Biogenesis, created life (Genesis 2:7; Acts 17:25) and made it to produce after its kind (Genesis 1:11,24). But hasn’t genetics proved that evolution can happen through genetic mutations? Gregor Mendel is known by many today as the “Father of Genetics” (Considine, 1976, p. 1155). His work led to the series of genetic principles known as “Mendel’s laws” (Davis and Kenyon, 1989, p. 60). After his work was published in the Transactions of the Natural History Society of Brünn, his work was left essentially untouched and unknown for some 35 years, until other well-known geneticists conducted research which cited his. One of those—Hugo de Vries, a Dutch evolutionary botanist—is credited with having discovered the existence of genetic mutations (“Hugo de Vries,” 2013). The Law of Biogenesis’ claim that life reproduces according to its kind, while arguably macroscopic in its application to biogenesis, is in keeping with the evidence at the genetic level as well. It provides further support for that important concept: life reproduces according to its kind. Darwin’s theory of evolution has, itself, evolved over the decades. With further scientific investigation into the legitimacy of Darwin’s theory, time and again, evolutionists have been forced to admit that the current version of evolution cannot do what they previously thought it could. It never completely lines up with the evidence. The alleged evolutionary timeline, therefore, must be revised constantly: dates change as to when various animals lived in the distant past; the order of evolutionary development is endlessly revised; new theories attempting to explain why various animals developed particular body parts are constantly being developed. The theory of evolution evolves. And truly, the evolution of evolution is not a process that has been in effect for only a few decades. Evolution itself did not originate with Charles Darwin. Forms of evolution have been considered for millennia, at least as far back as the 600s B.C., with Thales and his Milesian school and the Ionian school (Conford, 1957). And for millennia, those ideas have had to be continually revised to attempt to stay in keeping with the latest scientific understanding. Regardless, Darwin came along at the right time in history for evolutionary theory to “take off” and gain followers. This circumstance was due to various reasons, not the least of which is surely the fact that he gave the irreligious a “respectable” reason to reject God. The result: Darwin is typically considered the “Father” of evolution. As is implied by the title of Darwin’s famous book (i.e., The Origin of Species By Means of Natural Selection..., 1859), the fundamental premise of Darwinian evolution was originally natural selection. Natural selection is the idea that nature selects those species that are most “fit” or suited to a particular environment for survival. Those species which are not as well-suited, and which do not migrate to environments more conducive to their anatomy, will die out. That idea is largely true and observable, and the creationist has no problem with it. It does not contradict the evidence or the Creation model. For many people, including many biologists, natural selection is like a magic wand. There seems to be no limit to what one can imagine it accomplishing. This extremely naïve perspective toward natural selection is pervasive…. [N]atural selection is not a magic wand but is a very real phenomenon, it has very real capabilities and very real limitations. It is not all-powerful (2008, p. 46, italics in orig.). Scientists have realized today that Darwin was wrong. Natural selection alone would not suffice to cause evolution to occur. Evolutionary paleontologist Stephen Jay Gould of Harvard University once explained, “The essence of Darwinism lies in a single phrase: natural selection is the creative force of evolutionary change. No one denies that selection will play a negative role in eliminating the unfit. Darwinian theories require that it create the fit as well” (1977, p. 28, emp. added). Therein lies the problem. Evolutionists recognize today that they cannot even claim that natural selection could create the fit. Hugo de Vries long ago said, “Natural selection may explain the survival of the fittest, but it cannot explain the arrival of the fittest” (1905, pp. 825-826, emp. added). It was not until the 1930s that Darwinian evolution and Mendelian genetics were combined in what became known as the neo-Darwinian synthesis. According to neo-Darwinian theory, traits are passed on by genes that reside on microscopic thread-like structures in the cell called chromosomes, and new traits arise from accidental genetic mutations (2011, p. 18, emp. added). According to neo-Darwinism, random mutations could accidentally create new species over time, and natural selection could eliminate the unfit ones, leaving the better, more evolved species in existence. Concerning neo-Darwinism, molecular biologist John McFadden wrote: “Over millions of years, organisms will evolve by selection of mutant offspring which are fitter than their parents. Mutations are therefore the elusive source of the variation that Darwin needed to complete his theory of evolution. They provide the raw material for all evolutionary change” (2000, p. 65, emp. added). Years ago, George Gaylord Simpson and his co-authors said, “Mutations are the ultimate raw materials for evolution” (1957, p. 430). One genetics textbook put it this way: “Mutations constitute the raw material for evolution; they are the basis for the variability in a population on which natural (or artificial) selection acts to preserve those combinations of genes best adapted to a particular environment” (Snyder, et al., 1985, p. 353, parenthetical item in orig.). Is it true that mutations can provide the raw material and mechanism for Darwinian evolution to occur over millions of years? 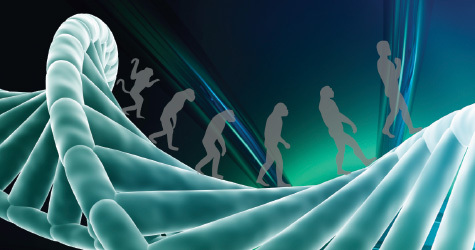 Do mutations eliminate the need for a supernatural Source to explain the origin of species? Recall Stephen Meyer, origin-of-life biologist and doctoral graduate of Cambridge University. In his book on the origin of genetic information, he discussed one of the greatest discoveries of the twentieth century—the structure of the DNA molecule by James Watson and Francis Crick. He noted that “when Watson and Crick discovered the structure of DNA, they also discovered that DNA stores information using a four-character chemical alphabet. Strings of precisely sequenced chemicals called nucleotide bases store and transmit the assembly instructions—the information—for building the crucial protein molecules and machines the cell needs to survive” (2009, Ch. 1). Information is packed into our genes, and its transfer during reproduction is critical. Without the transfer of information, there would be no such thing as life. The concept of “information” is not only of prime importance for informatics theories and communication techniques, but it is a fundamental quantity in such wide-ranging sciences as cybernetics, linguistics, biology, history, and theology. Many scientists therefore justly regard information as the third fundamental entity alongside matter and energy (2007, Ch. 3). Meyer argues that “[o]ur actions show that we not only value information, but that we regard it as a real entity, on par with matter and energy” (2009, Ch. 1). Indeed, “[a]t the close of the nineteenth century, most biologists thought life consisted solely of matter and energy. But after Watson and Crick, biologists came to recognize the importance of a third fundamental entity in living things: information” (Ch. 3). I can share with you one true law that all of us can agree upon. This law is so profound that most of us take it completely for granted. Yet it is the starting point for almost everything we do in paleontology, developmental biology, and genetics. This biological “law of everything” is that every living thing on the planet had parents. Every person you’ve ever known has biological parents, as does every bird, salamander, or shark you have ever seen.... To put it in a more precise form: every living thing sprang from some parental genetic information (2009, p. 174, emp. added). The scientific evidence indicates that genetic information is always passed from parents (even though if evolution is true, originally there could not have been parents). It does not spring into existence. So how did it originate? How could it originate, without an initial Parent capable of creating genetic information? Obviously, the existence of genetic information, its transfer from parent to offspring, and the mechanism—the software and the hardware—by which it transfers are critical to life. More importantly, their origin must be explained, since the creation/evolution debate hinges on that explanation. Under the evolutionary model, the first life had to be information rich, though being the product of non-living matter. From that life, an immense amount of other information had to be “written” into the genome over time through mutations during reproduction in order for humans to be in existence today. And yet, in the words of Gitt, “There is no known law of nature, no known process, and no known sequence of events which can cause information to originate by itself in matter” (Ch. 6). Every attempt to explain the origin of biological information either failed because it transferred the problem elsewhere or “succeeded” only by presupposing unexplained sources of information…. Every major origin-of-life scenario—whether based on chance, necessity, or the combination—failed to explain the origin of specified information. Thus, ironically, origin-of-life research itself confirms that undirected chemical processes do not produce large amounts of specified information starting from purely physical or chemical antecedents (Ch. 15, emp. added). A further puzzle remains, namely the question of the origin of biological information, i.e., the information residing in our genes today…. The Mainz report may have an equally important historical impact, because for the first time it has now been determined unequivocally by a large number of scientists that all evolutionary theses that living systems developed from poly-nucleotides which originated spontaneously, are devoid of any empirical base (1983, pp. 968-969, emp. added). In other words, no scientist has any empirical evidence that biological information could spontaneously generate. But evolution requires the spontaneous generation of information. Without such a process, naturalistic evolution has no mechanism for the initial generation of information at the onset of life or for interkind transformation. [M]utations do not appear to bring progressive changes. Genes seem to be built so as to allow changes to occur within certain narrow limits, and to prevent those limits from being crossed. To oversimplify a little: mutations very easily produce new varieties within a species, and might occasionally produce a new (though similar) species, but—despite enormous efforts by experimenters and breeders—mutations seem unable to produce entirely new forms of life (1985, p. 55, emp. added). Gould said, concerning mutations, “A mutation doesn’t produce major new raw material. You don’t make a new species by mutating the species…. That’s a common idea people have; that evolution is due to random mutations. A mutation is not the cause of evolutionary change” (1980, emp. added). A mutation does not “produce major new raw material”? What does that mean? Sanford likens the genome to an instruction manual for making human beings. In his analogy, letters correspond to nucleotides, words correspond to small clusters of nucleotides, “which combine to form genes (the chapters of our manual), which combine to form chromosomes (the volumes of our manual), which combine to form the whole genome (the entire library)” (2008, p. 2, italics in orig.). In the printing, re-typing, or digital copying of a book, errors—or mutations—will sometimes appear when you examine the finished product. For example, individual words could be garbled—a few letters of a word could be changed to other letters, termed codon errors in genetics. Duplication could occur—the idea that words, sentences, and even entire paragraphs could be duplicated somewhere within the book. Translocation could occur—where sections from one part of the book are moved and inserted elsewhere in the book. Deletion could occur—where segments of the book are simply lost. Though these kinds of errors or mutations (and others) can occur, no new material is written when they do. No new information has been added to the book. A new sentence has not been written into the story. The problem with evolutionary theory is that it requires new sentences and even chapters to have been written through mutations in the genetic “book.” In fact, it requires sequels of the book to write themselves into existence through random mutation. Conford, F.M. (1957), “Pattern of Ionian Cosmogony,” in Theories of the Universe, ed. Milton K. Munitz (Glencoe, IL: Free Press). Davis, Percival and Dean Kenyon (1989), Of Pandas and People (Dallas, TX: Haughton). “Definition: Rudolf Virchow” (2006), Webster’s Online Dictionary with Multilingual Thesaurus Translation, http://www.webster-dictionary.org/definition/virchow. Dose, K. (1983), “The Origin of Life,” Nachrichten aus Chemie, Technik und Laboratorium, 31:968-969. Flew, Antony G.N. and Thomas B. Warren (1977), The Warren-Flew Debate on the Existence of God (Jonesboro, AR: National Christian Press). Gallik, Stephen (2013), “Exercise 1. The Discovery of Cells. D. Schleiden, Schwann, Virchow and the Cell Theory,” The On-line Lab Manual for Cell Biology 4.0, http://stevegallik.org/cellbiologyolm_Ex001_P04.html. Gould, Stephen J. (1980), “Is a New and General Theory of Evolution Emerging?” Hobart College speech, 2-14-80; quoted in Luther Sunderland (1984), Darwin’s Enigma (San Diego, CA: Master Books). Gould, Stephen Jay (1977), “The Return of Hopeful Monsters,” Natural History, 86:12-16, May. Hayward, Alan (1985), Creation or Evolution: The Facts and the Fallacies (London: Triangle Books). “Hugo de Vries” (2013), Encyclopaedia Britannica Online, http://www.britannica.com/EBchecked/topic/633337/Hugo-de-Vries. Jevons, W. Stanley (1888), Elementary Lessons in Logic: Deductive & Inductive (New York: MacMillan). Kuppers, Bernd-Olaf (1990), Information and the Origin of Life (Cambridge, MA: M.I.T. Press). McFadden, John J. (2000), Quantum Evolution: The New Science of Life (New York: W.W. Norton). Miller, Jeff (2012), “The Law of Biogenesis [Part I],” Reason & Revelation, 32:1-5,9-11, January. Miller, Jeff (2013), “Evolution and the Laws of Science: The Laws of Thermodynamics,” Apologetics Press, http://www.apologeticspress.org/APContent.aspx?category=9&article= 2786. “Rudolf Virchow” (1973), Encyclopaedia Britannica (London: William Benton Publisher). Simpson, George G., C.S. Pittendrigh, and L.H. Tiffany (1957), Life: An Introduction to Biology (New York: Harcourt, Brace). Snyder, Leon A., David Freifelder, and Daniel L. Hartl (1985), General Genetics (Boston, MA: Jones and Bartlett). Thompson, Bert (1981), The History of Evolutionary Thought (Montgomery, AL: Apologetics Press).